The meat judging team traveled to the University of Missouri-Columbia this past weekend and competed in the 2018 Missouri Association of Meat Processors Contest. This contest was comprised entirely of processed products donated by processors from across Missouri. Classes included: boneless hams, bone-in hams, bone-in smoked pork chops, center-cut ham slices, frankfurters, ring bologna, coarse ground fresh bratwursts, sliced bacon, sweet peppered bologna, and summer sausage. In lieu of written reasons, 10 questions were asked on four of th e classes. Hannah Engle (Ames) finished 8 th in the contest, as well as 5 th in placings and 7 th in questions; Kaitlyn Boyer (Weldon) was 3 rd in specifications; Darin Koch (Osage) was 7 th in placings; and Jen Vander Lee (Hartley) was 10 th in specifications. 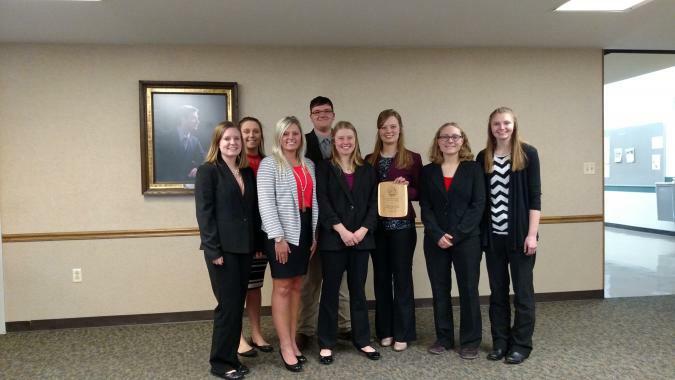 The team was 2 nd in the team summer sausage category and 3 rd in specifications – finishing in 5 th behind Illinois, Nebraska, Missouri, and South Dakota State University. Additional team members included: Georgia Androy (Malvern), Shelby Deaton (Baxter), Macy Leonard (Newton), and Kaitlyn Olson (Luana). At the end of March, the team will be traveling to Oklahoma City for the American Meat Science Association Student Leadership Conference, and then finish up the judging season by competing in the Southeastern in early April at The Ohio State University - Columbus and the University of Kentucky – Lexington. Macy Leonard, Georgia Androy, Shelby Deaton, Darin Koch, Kaitlyn Olson, Kaitlyn Boyer, Hannah Engle, and Jen Vander Lee.